As we were beginning to think we had turned the weather corner into spring, yesterday Mother Nature issued a reminder that, “no indeed, it’s still winter!” When I awoke yesterday morning and looked outside, there was a new coating of very freshly fallen snow, clinging to everything and still coming down. It was quite beautiful! I decided to jump into my clothing and spend the morning shooting while making my way across town to teach a photography class in the afternoon. 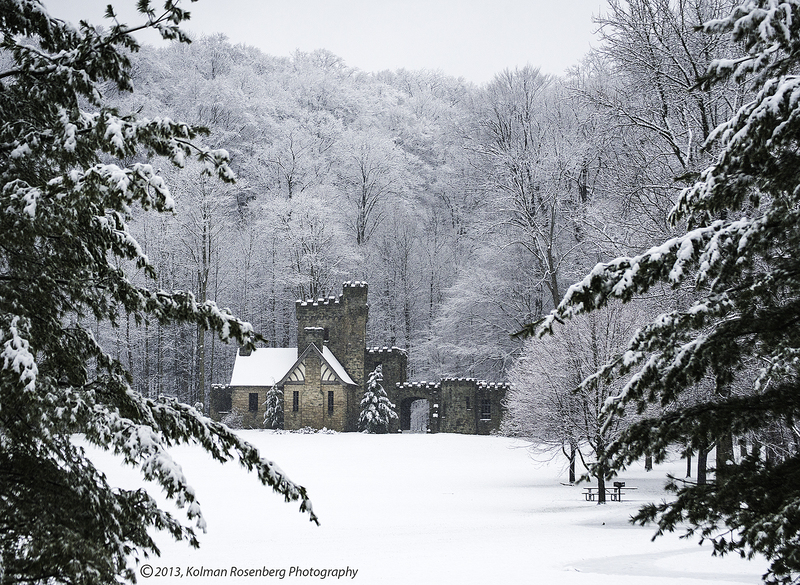 My first inclination is to go thru the Metroparks looking for snow covered landscapes and when I came the the often photographed Squires Castle I saw it as I had never photographed it before. It was decked out in winter garb as were its surroundings. I was particularly taken by the snow-covered trees climbing the hill out of the river valley, just behind it! On my way to the park, just about a half mile from the castle, I turned a corner and saw this red barn, sitting behind a home. I understand that this barn was just cleaned up and renovated and a friend of mine shot it not too long ago, surrounded by brush and trees and in a state of dis-repair. It looked like it had been turned into a residence and in fact I took the liberties of removing a few features in order to return it to its barn status. It was snowing hard at the time and this photo looks like it could have come from a Christmas card. I really like the snow highlighted wagon wheels leaning against the foundation! Sometimes it’s just the little things that make a photo memorable! 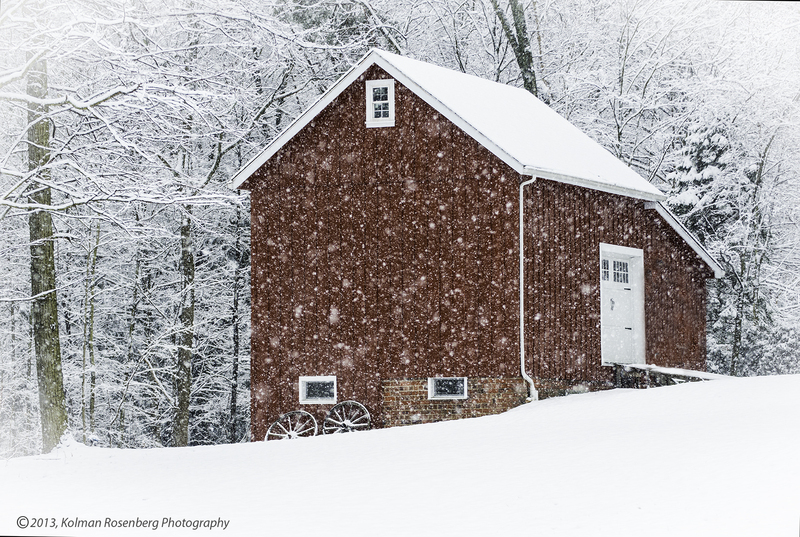 This entry was posted in Uncategorized and tagged barn, chagrin river, ice, March, metro park, mother nature, North Chagrin, OH, ohio, park, red, rural, snow, Spring, squires castle, valley, Willoughby Hills, winter, woods. Bookmark the permalink. Squires Castle — what a beautiful, ethereal scene! It looks like something out of Hansel and Gretel. Thanks Lenore! It was quite a beautiful scene! What a beautiful shot of Squires, Kolman!! Very nicely done!! Thanks Dave! It’s always nice when you have a beautiful subject to shoot! Makes it pretty easy! Thanks Sally! It was a beautiful morning out there! That red just pops. Another instance of being in the right place at the right time with a camera waiting to be put to use. I would have liked to see the barn photo before you tweaked it too. No snow here in Wellington. Thanks Patricia! People always recommend having someone in a red or bright yellow jacket in your photos to make them pop. In this case I was fortunate to have a barn! I took the liberties of removing a door and window which destroyed the barn look for me but the owners I’m sure appreciate having! Both shots are beautiful. I really like the way you used the pines in the top shot to frame the image. Great work…as usual. Thanks Bob! I usually make an effort to shoot things that others shoot from a very different perspective. I’m sure I’m not the first to see this shot of Squires Castle, but it’s not one I’ve seen before! Wow! I live in Mentor and have never taken a ride out to Squires Castle when there is snow. Have now added this endeavor to my Bucket List. Beautiful photo!!!! Hello Rosemarie, thank you for commenting on my blog, I hope you enjoy seeing and reading it! I’ve been out to Squires Castle in snowy weather before but it never looked this beautiful to me. On this day the way the snow was laying on the trees in the foreground and particularly the background was just magical looking! So beautiful! Thank you for posting. Thank you Nancy! That photo was taken last year but today is another day when it may actually look like that!